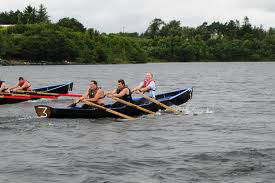 Currach racing was first introduced to Lough Corrib in the early part of the 60’s by the Pioneer Association and run in conjunction with the local Corrib Regatta. It consisted of one race. Two crews from Connemara and one local crew took part, but it wasn’t until 1980 that the first full scale Currach Racing Regatta took place. The currachs were on loan from the Aran Islands. Senior Crews, Junior Crews and mixed Double teams took part. In 1982 the committee had four currachs built locally by Tommy Mallon and at that period we had a great Junior Crew consisting of Billy Molloy, Eamonn Molloy and Mark Mollloy. In 1983 this crew had five outings of which they had three 1st prizes and two 2nd prizes. A Senior Crew of Walter Butler, Martin Butler and Patrick Molloy also had successful outings. At the Aran Island’s Regatta they finished 1st out of twelve crews. Winners at Carson Beach U.S.A.
1986 was the big success story when they competed successfully at Carson Beach U.S.A. The crew at this stage consisted of Walter Butler, Martin Butler and Martin King. They were the first fresh water crew to win such an event. They returned home with the cup that they won quite easily. The Club now own six currachs which is a tribute to members hard work and dedication over the years. A local Regatta is now held on the last Sunday of July and it will host All Ireland Currach Racing Championships which will include, among others, a Naomhog Race for men and women. A Naomhog is a four-oar canvas boat, local to Kerry. Approximately 18 Senior Crews are expected to compete in the feature event this year. This page was added on 23/07/2011.